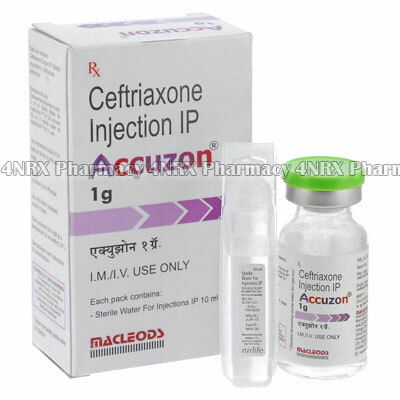 What is Accuzon Injection (Ceftriaxone) used for? Accuzon is an injectible form of the Ceftriaxone, an antibiotic indicated in the treatment of many different types of bacterial infections. It works by breaking the cell wall of the bacteria responsible for the infection. How should I use Accuzon Injection (Ceftriaxone)? Accuzone is to be administered via an intramuscular or intervenous injection. Shake the solution well to ensure the powder is sufficiently disoolved into the solution before injecting. Do not ingest Accuzon. Make sure the person who will be administering the injection has been advised how to do so properly. Follow the dosage instruction provided by your doctor when Ceftriaxone was prescribed. What are the side effects of Accuzon Injection (Ceftriaxone)? Some people will experience pain, redness and swelling around the site of injection. Accuzon has been reported to cause loss of appetite, nausea, vomiting, diarrhea, or headache. If Accuzon Injection causes any of the above, notify your doctor as soon as possible. Prolonged use of Ceftriaxone has been associated with a condition called Clostridium difficile-associated diarrhea. Symptoms of this condition are persistent diarrhea, severe abdominal pain or cramping, or blood or mucus in your stool. If you notice any of these side effects contact your doctor. Oral thrush or vaginal yeast infections have also been associated with prolonged use of Ceftriaxone. Babies with hyperbilirubinemia (high levels of bilirubin), prematurely born babies, or babies is to receive an IV medicine containing calcium must not be given Accuzon. Before using Accuzon (Ceftriaxone), make sure your doctor knows all the medicines you are currently taking. This includes prescription medicines, over-the-counter product and and herbal or nutritional products. Some of these will interfere with Ceftriaxone and prevent it from working as intended. If you have been allergic to any medicines, especially to any antibiotics, make sure to tell your doctor of this before beginning treatment.